The viewing area at the lodge's watering hole. Our time in South America is rapidly coming to a close. We are scheduled to fly back to the States from Lima, Peru on June 7th for my brother’s wedding. We thought we had everything planned out, that was until a good old South American protest got in the way. After leaving La Paz, Bolivia we had hoped to cross into Peru and hit up some of the major sights. A few days around Lake Titicaca then a short flight over to Cuzco to check out Machu Picchu followed by another short flight into Lima to link up with our award ticket back to the States. Unfortunately, the border between Bolivia and Peru was closed by large scale protests (about mining rights) in Peru about three weeks ago. From what we read in the news, all of the possible land border crossings have been closed by the protesters. Looting, burning cars in the streets, gunfire and what-have-you are the sorts of things in the news. Not exactly where we want to be. Most of the other travelers we have met are planning to detour through Chile in order to continue their trips into Peru. Flying is also possible but prices are sky-high due to the increased demand as well as Bolivia’s crazy ticket taxes. 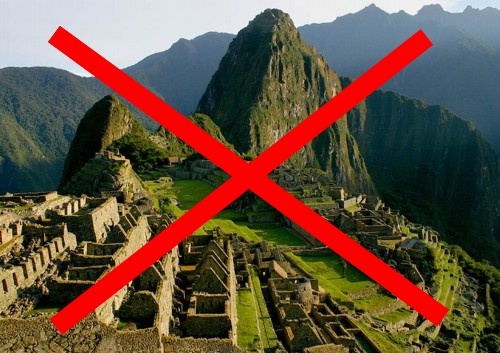 The vast majority of Peru is still safe for travel but we decided it would be too much of a rush to fit in this detour. Instead, we opted to visit the Bolivian side of Lake Titicaca and then use some miles to get from northern Chile (Arica to be exact) to Lima for our flight home. It is an 8-hour bus ride from La Paz to Arica but that hopefully won’t be too bad. The only routing available was via Santiago but that was still preferable to many hours on Peruvian buses and giving up our visit to Lake Titicaca. We will be making a two-day stop in Santiago and then will continue on to Lima, Miami, Denver then finally Montana. Peru will just have to wait for another trip. Of course the blog posts will keep coming over the next few weeks…I have quite a backlog of stories and photos to share! To be honest, Santiago was a bit of a let-down for me. It is mostly my fault as I had a preconcieved notion that it would be a mountainous version of Buenos Aires! Though it is a lively and clean city, it just doesn’t have the same flair as BsAs. Nevertheless, we still had some great food and fun adventures there. On our first full day in Santiago we got up at a decent hour and headed over to Plaza de Armas, the main square in Santiago. We wanted to take one of the “free english tours” that we saw advertised at the hostel. There are actually a couple organizations running these tours and they are indeed free though you are expected to tip the guide. A few minutes in to our “free english tour,” a group of Spanish speaking ladies walked up and pretty much demanded that our guide give the tour both in Spanish and in English. Surprisingly, he complied. Now I don’t mind listening to both languages (it is good practice, after all) but the way in which this ladies approached the situation was amazingly tactless. There were a few occasions when we were making small talk with the guide and the ladies marched up and demanded a translation. Awesome. I sure hope they tipped well at the end of the day. The tour lasted about 4-5 hours and took us past the main sights in the centro, Santa Lucia and Bella Vista. There was a short 20-minute stop for lunch at some cafe (in cahoots with the tour guide, no doubt) but we escaped that trap and got some cheat eats at a kiosko nearby. The tour provided a nice overview of the city but if I had to do it again I would seek out the organization that runs the shorter 1-hour version. Amy and I went to see a Chilean movie called “La Vida de Los Peces” that won the Spanish equivalent of an Oscar last year. Thanks to the Chilean Spanish I barely understood what was going on and even Amy said she only understood about half of what was said. Chilean Spanish is a good bit faster than Argentine Spanish as they are very fond of slang and shortening words. Food-wise, Santiago treated us well. My favorite (and cheapest) meal was at a stall at the Mercado de Flores where many of the pushcart vendors seemed to be eating. I had cazuela de vacuna, a soup with beef and a mix of veggies. Amy managed to find herself some vegan empanadas at one on of the city’s vegan/vegetarian cafes. Another culinary highlight of Santiago is a drink (or snack?) called mote con huesillo. It is served on the street and is something in between a drink and a food. When ordering mote you get a cup filled with cooked wheatberries, a few pieces of peach and then topped with lots of peach juice. It is a sweet and filling cheap snack that you can find just about everywhere in Santiago. Perfect for hot afternoons! The blog is starting to run quite a way behind our travel progress. We reached Bolivia yesterday and will be leaving on a 4-day circuit tour to the Salar de Uyuni starting on Saturday. We will be way out in the boonies for this tour but I am going to do my best to get some posts scheduled today. That is, if this Bolivian internet connection cooperates! After the trip to Easter Island we had a five day stopover in Santiago worked into our award ticket. We had hoped to spend about half that time in Santiago and the other half in Valparaíso. Unfortunately, the Easter holiday spoiled those plans. The man at our guesthouse in Santiago warned us of the difficulties associated with getting there and back again. He said it wasn’t uncommon for the bus ride to take upwards of 5 hours when it is normally under two. We took his advice and made a day trip out there on the Tuesday before Easter. Getting from Santiago to Valpo was a quick and easy process. A short trip on the Santiago metro followed by a 1 hour and 45 minute ride. Weather was cloudy and gloomy when we arrived around 10AM but that slowly burned off during the day. Valparaíso is a stunning city. The surrounding hills drop steeply to the water’s edge where there is a busy shipping port and a naval base. The hillsides are covered in houses of all colors that are seemingly stacked one on top of another. Many of the slopes are steep enough that funiculars, many of which date from the 1900′s, are needed to hoist tourists and locals up and down the hills. We passed most of the day by wandering around the city, riding the funiculars, and enjoying the spectacular views of the harbour. The neighborhood of Cerro Concepción, which is listed as a UNESCO World Heritage Site, was particularly beautiful. We also found a huge variety of street art in Valpo. Even more than we found back in Buenos Aires. A few people responded positively to my Buenos Aires graffiti post so we made it a point to snap lots of photos to capture Valpo’s street art scene. Hope you enjoy! Next up, Santiago. He needs to find a bigger box to sleep in.